You may have read about the visitors to our farm a few weeks ago. You may not have the opportunity to ride on a combine during harvest, but almost anyone can visit and farm this time of year! Pumpkin patches abound with great opportunities for everyone to see bits and pieces of farm life. And since we just did a homeschool unit about fall for my preschooler and kindergartener, here are some pumpkin theme ideas for you to use– and hopefully you can visit a pumpkin patch as well! Of course, cutting open a pumpkin and playing with the seeds are a must. 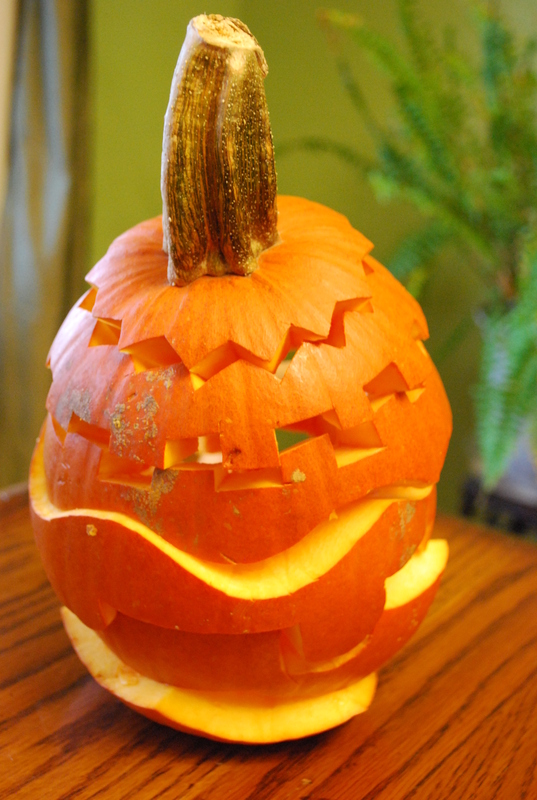 But instead of carving a face, try these math and science ideas instead. Clean the seeds, layer them on a baking sheet, sprinkle lightly with salt, and roast at 325 degrees for 20-25 minutes. Eat and enjoy! Make a pumpkin puzzle! We tried a few different designs and the best puzzles were pumpkins cut in horizontal “slices.” For older kids talk about how puzzle pieces lock together and have them help design the puzzle. For little ones just cut simple waves around the pumpkin to be used like stacking rings. Design a pumpkin patch of your own. We made fall leaves with my cricut, added a variety of pretty pumpkins, painted pumpkin leaves and vines, added a plastic rake from our summer sand toys, and talked about the pumpkin life cycle. And speaking of pumpkin life cycles, we designed our own pumpkin life cycle chart with a paper plate, a seed, and tissue paper flowers. Throw bean bags into a pumpkin. And then when you are done with the pumpkins, place pieces in a plastic tub (you’ll want a lid for this one!) and watch the pumpkin decompose. We journaled about our observations in our science journal.